The first match was against Middlesbrough, who as we can see were in a difficult position, one place off the foot of the table. Not surprisingly they had started to invest in their team spending a reported £8000 on players in the previous couple of weeks. But as we shall see, they were also ready to make a big money sale to support this lavishness. 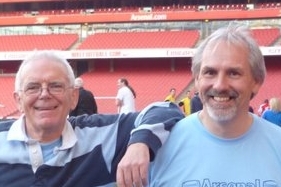 For Arsenal, Milne returned from injury after a one match absence at right half, and Haden came back on the left wing to replace Dr Paterson, who made a rare appearance out of position on the right wing instead of left. Graham returned at right half to replace the injured Milne. The result in front of a modest crowd of 25,000 was a 2-1 win to Arsenal with Townrow and Woods scoring. That made it two wins and a draw in the last three. Arthur Bourke in the local paper noted that Sir Henry Norris was not present (we don’t know why although it might have been that he was doing his duty with the reserves) and added that he thought the first 30 minutes (in which Arsenal scored both goals) was one of the best displays he’d ever seen from the club. Whatever the reason for Sir Henry’s absence it was not caused by another trip to his new home in France for the following Monday he made a rare appearance at an event in Fulham. If you have been following this whole series of articles you’ll know Sir Henry had now broken completely with the Fulham Conservative Party but he was a man who never once failed to recognise the work of the unsung hero and it was for this reason that he now broke his own rule of having nothing more to do with the Borough. For Sir Henry always continued to value the work of the people who did the hard graft – rather than those who pontificated and theorised on committees, and so on 5 November he attended the retirement celebration for Peter Lawson, who had worked for many years collecting the rates in the Borough (these being the days when rates were as often as not collected door to door). It was an excellent example of Sir Henry’s standards: no matter what argument he might have with the hierarchy he would never forget the man on the street who did the grafting. On the same day Arsenal played Brentford in the second round of the London FA County Cup. Only 2500 turned up – but then it was played with a 2.15 pm kick off meaning many working men could not have got to the game. Arsenal went 1-2 down by half time but came back to win 3-2. Voysey returned to the team now playing at outside right, and he got a goal, with Young and Woods getting the other two. However he remained an occasional player, not returning for another game with the first team through the rest of the month. The following Saturday was of course the return game with Middlesbrough, and in front of a poor crowd of 12,000 a goalless draw was played out. Indeed that crowd was low even for them in this season – their average was 17,000. Although it should be noted that even this modest figure was not the lowest in the first division at the time. Preston, Burnley, and the two Nottingham club all recorded lower average attendances in the top league, with Forest’s average being just 14,000. This interestingly compared with Millwall in the third division (south) who got an average of 16,765 during the 23/4 season, higher than those first division sides and higher than most of the second division. Arsenal’s average attendance for the season was 29,950 – second only to Chelsea by just under 1,000. London might not have the top clubs, but it certainly was the crowd puller in the league. (And that top club business was about to happen, although not quite yet. Meanwhile away from the football, although there had been a general election in November 1922 there was now talk of another just a year later. The Prime Minister had resigned in May and he was replaced by Baldwin who felt he personally needed a mandate to govern, and was sure another election would strengthen his grip on a Conservative party that was showing even more dissent over national policy than the newspapers were over the performance of Arsenal. The reasons for wanting an election were not however totally personal, although that was a lot of the issue. Strikes were continuing to disrupt the economy, the country owed a huge debt to the United State, and French troops remained in occupation of parts of Germany. Baldwin wanted to change the direction of the economy, and felt he could carry the country with him if he got a mandate in a general election. The election did not happen until December, but in the run up Lady Edith Norris, wife of course of Sir Henry, was approached by the Liberal Party to stand as a candidate in Fulham East, Sir Henry having made it quite clear before the previous election that he would have no more to do with politics. Lady Edith declined – I wonder if she discussed the matter with Sir Henry, but in the end it would probably not have mattered for although the Conservatives lost seats across the country, they held on to both the Fulham seats. Back with the football, with two wins and two draws in the last four games Arsenal had moved up to 15th out of 22, five points clear of the relegation spots. Improbable as it may seem, Cardiff were top of the league, one point ahead of Huddersfield in second. Both clubs were showing very positive away form, emphasising the change of tactics away from home to be the new way of making progress – as long as one had the players to do it. Arsenal’s next game was on 17 November, at home to Tottenham. As we have noted, the away game to Tottenham last season had been particularly fiery and had led to an FA enquiry. As expected a crowd of 50,000 turned up at Highbury but the fireworks were now missing, and the game ended 1-1, Townrow scoring. Tom Whittaker continued at left back in a defence that now only had three of its opening back six now playing. Most particularly Bob John had not played for six games, and the prognosis was that he wouldn’t be back until well into the new year. Indeed it would not be until mid-February when the old back six got back together, and then they seemed so surprised to see each other again that they promptly put on a bad show and lost at home. But to return to November, the results up to 17 November had left Arsenal just two points behind Tottenham having scored one goal fewer, and conceded four goals more. A win for Arsenal was a possibility it was felt – but it was not to be, Tottenham winning 3-0 in front of 31,624 at the Lane. Arsenal made two changes for the game: Turnbull and Woods at centre forward and inside left were replaced by Young and Baker. They were changes forced upon Arsenal by injury, and both players seemed to be affected by their lack of first team experience in the season. For Baker it was only his third game of the season and nerves seemed to get to him. For Young there was a different problem. He had played five games, four at centre forward one at inside left, but had yet to score. But perhaps the Arsenal players had thoughts elsewhere, as two days later on 26 November Arsenal played the LFACC semi-final against Millwall – although I fear I am looking for too many excuses in saying that. Yes it was a semi-final but as the crowd had been so small for the game against Brentford I think this is pushing the explanations a little too hard. Jones had joined Arsenal directly from the Royal Navy, and those two end of season games were his only appearances for Arsenal. Subsequently he went on to play for Aberdare Athletic. Meanwhile Arsenal were apparently seriously investigating the option of buy Andrew Wilson who was playing with Middlesbrough and who had been the country’s top scorer in the previous season. The fee was reported to be in the region of £5000 to £6000 – possibly a new record if the rumours were true. Now we know that Knighton made the accusation that Sir Henry Norris would not allow him to buy any players who cost over £1000, but that he had most certainly paid more that that for some players since he became manager in 1919. This “confusion” of Knighton’s probably came about because in his submission to the League in which Sir Henry opposed the wage cap but wanted instead a transfer cap, he had proposed £1000 for that transfer cap. The League turned the proposal down. The last thing the toffs in the directors’ box wanted in a country beset by strikes over pay, was to find their own players downing tools (or perhaps that should be boots) and going on strike. With a maximum wage they knew there was nothing they could do. Certainly Sir Henry did sign off the transfer of a number of players for well over £1000, but he never made it to the £5000 mark, and indeed the local Islington paper also thought the fee was ludicrous; so it is worth following this story through, not least because it has a most unusual feature within it. In Scotland, just as in England, the main football league did not have everything its own way at the start. In England the Southern League was a rival and was particularly noted for its refusal to accept the retain and transfer system, which tied players to clubs. Thus Andrew Wilson was forced to leave Dunfermline where he had been playing and go back to Middlesbrough where he played previously. It turned out to be a success for both Middlesbrough and the player, as he became the league’s top scorer. 1922/3 saw them slip further to 18th, and although Wilson was not a drain on their resources, since as we have noted all players had their salaries capped, Middlesbrough saw a chance to clear some of their debts by selling the player on. It was then said that Arsenal were a possible destination given the way their goal scoring had dried up. They had scored 61 in 1922/3 and yet were clearly going to get nothing like this, in 1923/4. Indeed the only clubs who scored fewer than Arsenal in 1923/4 were the two relegated sides. In the end the player did leave Middlesbrough, although not for Arsenal but for Chelsea and the talk at the time was of £6500 for Wilson. However transfer amounts quoted from these days were normally little more than speculation, with clubs sometimes talking up the amount paid in order to gain more publicity and higher crowds. But the evidence suggests it was unlikely that this was the figure. The generally accepted record transfer figures for this period are normally cited by most sources as £5000 in February 1922 for Syd Puddefoot from West Ham to Falkirk, £5500 the following month for Warney Cresswell from South Shields to Sunderland and then no more record breakers until December 1925 when Bob Kelly went from Burnley again to Sunderland for £6500. So one might expect that although £5000 was a possible figure, it probably wasn’t any higher. And the winner in the transaction was Middlesbrough not Chelsea, since although Middlesbrough were relegated at the end of the season, the club got its money, and such were Wilson’s figures, he was still their top scorer at the end of the season. Interestingly Chelsea were also relegated – and he was their top scorer too – but they had to pay for the privilege. Meanwhile away from the football there was an interesting exchange involving the man who had become the Liberal candidate for Fulham East in the forthcoming general election – that is the candidacy earlier offered to Sir Henry’s wife. For a reason which is not clear – but perhaps because of the interaction between the Liberal Party and Lady Edith, Sir Henry wrote to Mr R C Hawkin, the man who was given the Liberal nomination after Lady Edith turned it down. It may have been that Mr Hawkin wrote first to Sir Henry seeking his views. If so that letter has not emerged. The Fulham Chronicle naturally took up the issue and on 30 November it reported Sir Henry’s views as “an incentive to…Free Traders throughout the country”. It also noted that Sir Henry had refused to stand in the seat for his own party – which of course was true, but a little misleading since at this time Sir Henry was backing out of virtually all commitments of both a social and political nature, save for those associated with Arsenal. The paper called it a “bomb-shell for East Fulham Conservatives”. However the Chronicle was not, and indeed for many, many years had not in any way, been a friend to Sir Henry. Thus it was no surprise that it accused Sir Henry of deliberately trying to damage the Fulham Conservatives (for whom he had worked consistently for so many years). Also, in the true nature of local papers everywhere, it manipulated the letter, only publishing the bits that suited its argument, knowing that in such a case Sir Henry would have trouble in suing; the words they used were after all his. Taking words out of context is very hard to use as a reason for a request for damages in the courts. But the Liberals were very pleased with the affair and quoted Sir Henry’s letter to its candidate, suggesting that all Conservatives who supported Free Trade should now support the Liberals at the general election. Thus the month ended. Back with the football Arsenal had not broken the transfer record, but they had played five games, winning tw0, drawing two, losing one. One other was abandoned with Arsenal 2-0 up. Here are the results. No crowd is recorded for the abandoned game. And the league table for the end of the month…. Preston at the foot of the table looked doomed already – but of course as we all know, it’s a funny ol’ game.